Knowledge Is Power Program, a charter school with locations across the nation, is planning to double its enrollment in Los Angeles in the next six years. This lofty goal threatens the stability of traditional public schools, which will be forced to contend with a drop in enrollment. KIPP celebrated its 20th anniversary this year. In the past two decades it has expanded from just two schools to 162 schools across the nation. The program currently enrolls 59,000 students, including 4,000 students in L.A.
History of KIPP Schools on Dipity. When 10-year-old Domenico Medina attended Soto Street Elementary School, he was a C-level student. He argued with his mother about getting up to go to school, rarely completed homework assignments on time and complained that his classes were boring. Domenico’s mother, Victoria Medina, said nothing has been more transformative for son’s disposition towards his own education, than switching to Knowledge is Power Program (KIPP) Sol Academy. “Now he’s excited about school. Even though he’s still young and only in fifth grade, he’s beginning to understand the value of learning and how that will help him his whole life,” Medina said. KIPP, an independent public charter school is seeking to create more students like Domenico across Los Angeles. In October, KIPP L.A. officials announced a growth plan initiative to more than double its current enrollment over the next six years. However, KIPP’s expansion could create problems for traditional public schools in Los Angeles Unified School District. The growth of charter schools including KIPP has caused enrollment to drop off in many parts of LAUSD, according to the L.A. Times. It has also resulted in fewer union teaching jobs within the district. Currently, KIPP L.A. has about 4,000 students across 11 schools in the city. By the year 2020, KIPP L.A. Executive Director Marcia Aaron expects these numbers to balloon to 10,000 students in 20 schools. “The families in these communities are demanding access to an excellent college-preparatory public education for their children. KIPP L.A.’s growth will help meet that demand,” Aaron said in a press release. Charter schools such as KIPP are part of the LAUSD system, but they are unique in that they are allowed to operate outside certain laws and regulations that govern traditional public schools. The privileges afforded to KIPP schools have proven quite effective in increasing student achievement. Of the data available (KIPP schools that opened in the past two years do not yet have published test scores) all KIPP L.A. schools outperform traditional public schools in their surrounding neighborhood. Additionally, KIPP Empower in South Los Angeles is the highest preforming school in LAUSD with an Academic Performance Index of 991 out of a total possible score of 1,000. KIPP teachers and administrators declined to comment on any of their educational methods not listed on their website. “The families in these communities are demanding access to an excellent college-preparatory public education for their children. KIPP L.A.’s growth will help meet that demand." The program’s high testing scores will remain part its appeal as it continues to expand, but KIPP may not openly advertise or promote its test scores to draw students to the school. The LAUSD Charter School division states that charter schools “may not compel students to attend nor teachers to be employed at the charter,” according to its website. However, the schools will inherently compete for the same students, an issue that concerns Jeffrey Snyder, an associate professor of educational studies at Carleton College. “If you do care about the local public school, the neighborhood school, the people who live around it, send their kids there, has a mascot, a history and a connection to community – when those schools shut down, or really start operating on fumes because of competition from charter schools I don’t think you can argue that you’re not loosing something,” Snyder said. KIPP teachers and administrators declined to comment on how they recruit students and the effect their growth may have on traditional public schools. Nora Gonzales, the principal of Brooklyn Avenue Elementary School, said that she has lost five students to charter schools this year, a number she calls insignificant – at least for now. While test scores are one way to quantify schools’ successes, Snyder said that these numbers may not tell the whole story. Snyder openly criticized KIPP in an article in the New Republic, which addressed his qualms with the character-based education model that KIPP uses which evaluates students on seven positive character traits: zest, grit, optimism, self-control, gratitude, social intelligence and curiosity. 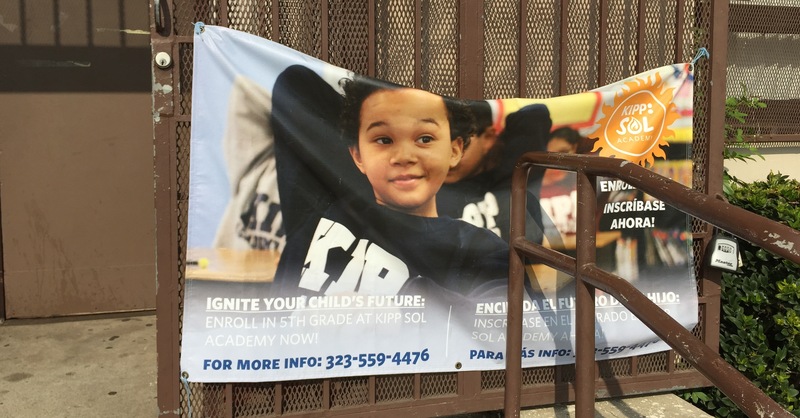 The criticism surrounding KIPP is confusing to some parents, and therefore many like East L.A. mother of three, Carmina Entuna, see no reason to enroll their students in a hotly debated, non-traditional program. “I don’t know much about KIPP’s programs, so it’s easier to have my kids go to the school they are assigned to, and I don’t have complaints about Brooklyn Avenue Elementary School anyway,” Entuna said. Yet many parents who have opted for the non-traditional path, and enrolled their children in KIPP or other charter schools say the experience is worth the initial uncertainty. Where Does KIPP Exist Now? Currently there are 4,000 students in 11 KIPP schools across Los Angeles. The 11 schools are located in South and East L.A. Click on each marker to view each school's contact information. 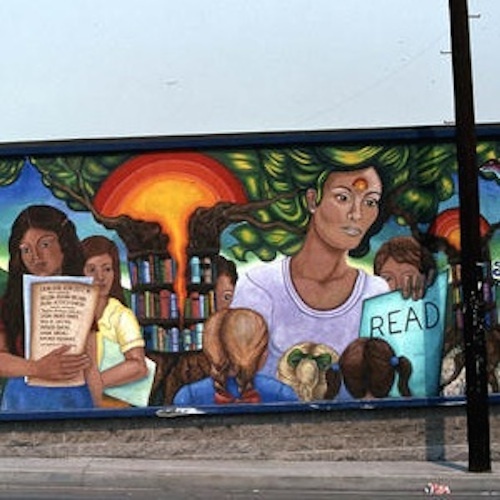 Read about the public library that was named after the prolific actor and iconic figure for the East L.A. community, Anthony Quinn. 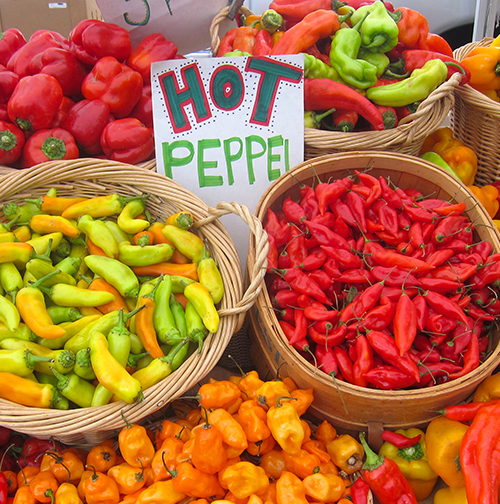 How health food markets sandwiched between fast food chains and cheaper markets can still survive with their unusual products and health food products. About half the residents in this part of East L.A. are foreign born, but due to limited resources, few are able to travel to their countries of origin. A small chapter of an international bus travel service, Tufesa, is making it easier for people to connect with their loved ones far from home.